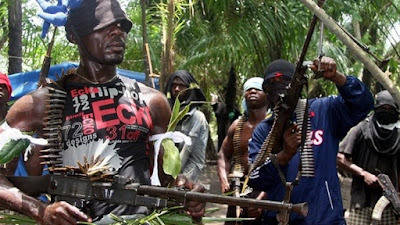 Residents have reportedly fled Ndoro community in Ekeremor Local Government Area of Bayelsa for fear of invasion by security agents following alleged beheading of a security operative by militants. Premium Times correspondent learnt on Friday that the murdered security official was negotiating with militants in the area to surrender their arms. According to a resident, the community was thrown into apprehension on Monday “after the lifeless body of the ‘security emissary’ was seen in the community without his head. The source said the victim could not be identified because he was in plain clothes. “The community has been deserted as we speak due to fear of imminent manhunt for the militants behind the dastardly act,” the resident said. However, the Bayelsa State Government on Friday called on the fleeing members of the community to return home, saying everything was under control. Daniel Iworiso-Markson, the state Commissioner for Information, said Governor Seriake Dickson had held a meeting with security chiefs, officials of the military high command, and leaders of the community over the incident. The Commissioner said the member representing Sagbama/Ekeremor federal constituency in the House of Representatives, Fred Agbedi, also attended the meeting. Mr. Iworiso-Markson, in statement on Friday, said the meeting resolved that the military should move into the community to return normalcy, while the government begins a peace process. “So we call on all those who have fled the community to return. There is no cause to be scared as government has intervened to ensure that the situation is brought under control,” the statement read in part. The government called on all who had fled the community to return home, assuring that with the presence of the military they could go about their normal businesses. The government said the situation had been brought under control by the state government’s quick intervention, while expressing regret over the incident.